After two-and-a-half years of hard work and innovation since the launch of the NRG COSIA Carbon XPRIZE, the teams have been narrowed down from 47 to 10. 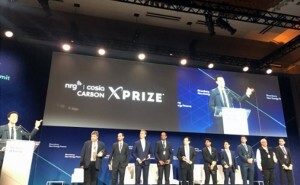 On Monday, April 9, the NRG COSIA Carbon XPRIZE announced the 10 finalist teams in its global competition. This US$20 million project is a Canada's Oil Sands Innovation Alliance (COSIA) joint industry project led by ConocoPhillips, along with six other COSIA members and NRG Energy. This competition seeks to inspire the brightest minds in the world to reimagine what can be done to convert carbon dioxide emissions into valuable products. The final teams showcase a variety of innovative ideas, including: converting captured CO2 into products like enhanced concrete, liquid fuels, plastics and carbon fibre. The finalists will take home an equal share of a US$5 million milestone prize to test their technologies for commercial deployment over the next two years. The competition has two tracks - one focused on testing technologies at a coal-fired power plant and one focused on testing technologies at a natural gas-fired power plant. Each track operates as a separate competition on the same timeline. The two teams that convert the greatest amount of CO2 into products with the highest net value while creating the greatest environmental benefit will be grand prize winners of the NRG COSIA Carbon XPRIZE. Click here to learn more about the final 10 teams. Starting later in 2018, the five finalist teams in the natural gas track will begin testing their technologies at the Alberta Carbon Conversion Technology Centre at the Shepard Energy Centre in Calgary. As the first tenants at the new facility, the finalists will use CO2 from the flue stream at the Shepard Energy Centre, Alberta's largest natural-gas fueled power plant jointly owned by ENMAX and Capital Power, to demonstrate their technologies are ready to go commercial. Separately, five finalist teams in the coal track of the competition will test their technologies at a test centre in Wyoming. In 2020, the winner in each track is eligible for a US$7.5 million grand prize.